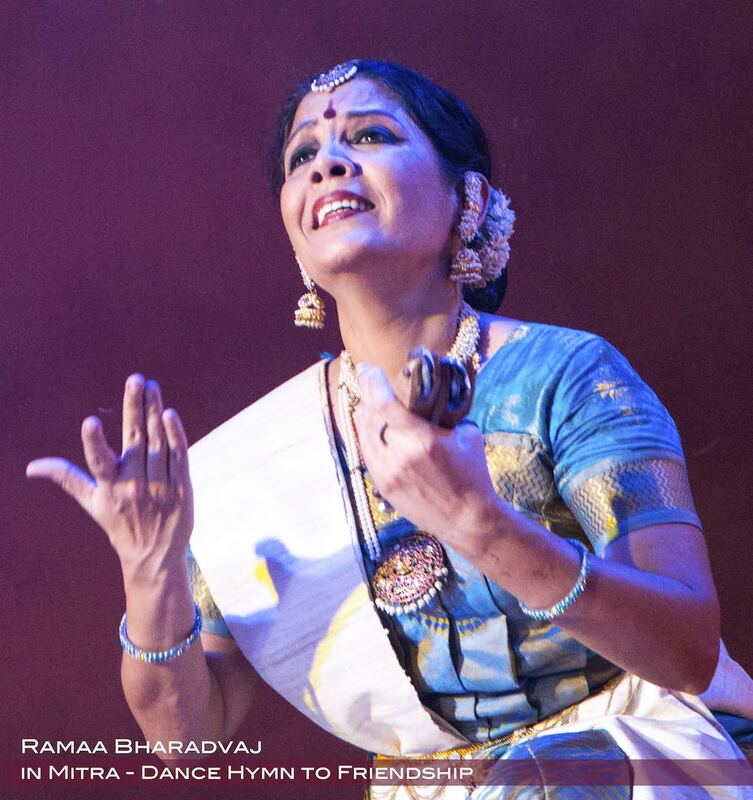 Ramaa Bharadvaj is a dancer, teacher, movement designer and writer. A recipient of international awards and recognition, Ramaa lived and worked in the US for 31 years. In 2009 she returned to India and currently leads the dance division at Chinmaya Naada Bindu Gurukul for Performing Arts. She lives in Bangalore, works in Pune, bonds in Chennai and vacations in California. I had the chance to interact with her and watch her perform her acclaimed feature "MITRA" at Ananya Nritya Neerajana, an Arts festival in November 2014. Her charismatic persona instantly drew me, and the depth of her presentation made me want to take a sneak-peak into her dancing career. A question that I often ask Artistes is : "How did dance happen?" for the answers drawn from this question are always very inspiring. Snippets from her initial experiences and early training. When my twin sister Uma & I were 3 years old, a dancer named Jaya lived a few houses away. We would run off there to watch her rehearse. Jaya taught us a couple of dances to songs by Arunachala Kavi and had us perform in her shows during her dress-change breaks. During one of those performances, Padmashree Vazhuvoor Ramaiah Pillai saw us. What they say about the guru finding the student is true because it was he who approached my parents about teaching us. This was a Divine marvel because at that time he was a most sought after guru with many celebrated disciples. Vadyar, as everyone called him, and his son Samraj were loving teachers. Our first performance was at age 4 in their dance drama “Kapilai Natakam”. I was a baby calf and my sister was Ganapati. At age 6 we presented our Arangetram with 13 dances lasting 3 hours, at the Rasika Ranjani Sabha in Chennai. My uncle Sengalipuram Anantharama Dikshitar who was an eminent religious raconteur, had arranged for the whole thing. So, the glitterati from the political, religious and arts fields were all there. Both Vadyar and Samraj conducted the Nattuvangam with Rajaratnam Pillai and Nattarasankottai Krishnan on the vocal. Clarinet used to be part of the orchestra back then. At age 8, we received the touring scholarship of the Tamil Nadu Sangeeta Nataka Sangam – the youngest dancers ever to get that honor to-date. However, at the verge of entering our teenage years Vadyar had not been teaching and there was irregularity in classes. At that time Padmabushan Dr. T.N.Ramachandran, the Director General of Archaeology, had just moved into a house in the next street. He became a family friend and began teaching dance theory to us. Many of the prominent dancers came to him to study about Karanas. He convinced my mom to let us continue our training under Kamala (Kumari Kamala). He felt she that she was a sincere person with no diva attitudes. Kamala turned out to be the most magnanimous guru anyone can ask for. She taught us without any fees; gave us her own costumes to wear because my parents couldn’t afford new ones; encouraged us to create movements; took us on national performance tours; even paid us for performances. Her faith and trust in me instilled the confidence to believe in myself. One such test came during our trip to New Delhi in 1975. We got news that due to a train strike, the nattuvanar would not arrive on time for the performance. Kamala called me into the dressing room and placing the talam in my hand, simply said, “Ramaa, you do the nattuvangam today. Raji (S. Rajeswari) will help you with reciting the jathis.” A quick lesson on how to hold the talam and beat the di-di-tai followed. That has been my only nattuvangam lesson ever. The famous critic Subbudu was in the audience and wrote a glowing review of my rhythm keeping skill. Today, when I encounter the obsession to attend workshops for everything from breathing to winking, I cannot help but wonder, whatever happened to the valuable tenet of “Watch, Listen and Learn.” On weekends, we would spend the entire day with Kamala, partly in class but mostly just watching her teach and choreograph. A sabha secretary once told my father, “Dance is for those from wealthy families. People like you should not bother with it.” This prevalent attitude would have ended our dance career, had it not been for the blessed entry of Kamala into our lives. She knew our family could use the money and arranged for a regular performance stint for us at the Taj Coromandel in Chennai. We danced with a live orchestra for 15 days in a month and it paid well. We would come home from college, get into make-up, and go to “work”. It was great fun. We taught her junior classes when she was away on tours. She taught us the entire choreography of her Prahlada Bhakti Vijayam production and appointed us as her assistants to teach the roles to the dancers from Colgate University. We also received the JS Magazine’s Youth scholarship for dance. We were barely 15 when all this was happening. Even my Kuchipudi training was a gift from Kamala. One day she took us to Vempatti Chinna Sathyam and requested him to teach us. He had great admiration for her and accepted us immediately. We never paid any fees for that either. Maybe she took take care of that too. I don’t know to this day. When I went to the US in 1978, I first began teaching because the immigrant families asked me to. But later, I began to integrate into the larger community through lecture demonstrations in community centers. It was that stepping out that kindled the desire to learn more in depth about our culture, its symbolisms and philosophy. But in 1981, when we were living in Boston, a viral infection left me partially disabled waist below. Neurologists said I will never dance again. My daughter Swetha was just an infant at that time. We had travelled to India and a wonder-incident happened at the Chidambaram temple involving her. My recovery was very quick after that and Swetha became my precious dance partner from then on. When we moved to California I got an offer to teach at Orange Coast College, which had a great dance department. I started the Indian dance division there, and that academic association expanded to other universities and colleges. I served on the advisory panel for state and national government grant agencies and developed my own grant-writing skills. It was a blessing that in the US there was no need for playing “political” games or to have a sugar daddy. With skill and hard work one can succeed. So, performances and choreographic commissions were plenty. Accolades included being featured on the cover of the prestigious Dance Magazine, receiving the Lester Horton Dance Awards and our work getting nationally telecast on PBS. I also worked with Educational Division of major arts Centres and took Indian dance into schools and underserved communities, as well as into prestigious venues like the Hollywood Bowl, Grand Performances, and Dorothy Chandler Pavilion. It was not just the dance anymore, but the culture itself that I was representing. She is the first Indian Dancer to win multiple Lester-Horton Awards for dance in the USA. I was unaware of these awards and was inquisitive to know more about them. It is an award that is given by the dance community – not by a panel of judges. Dancers nominate you and vote for you. So it was very special. I received 3 Horton Awards for both choreography and performance between 1993 and 2002. Awards create a platform to be heard. For me it was an opportunity to bring attention to an issue that faces the dance community everywhere – the fact that dancers are asked to dance for free at the excuse of being given “exposure”. I consider the choreographic process to have 4 parts: Spiritual, Intellectual, Physical and Emotional. Spiritual: This is the inspiration that descends on the artist, and it can come from anything or at anytime – it could be a title, a painting or photo, a story, or even a piece of fabric and the way it moves. Through dance we give a 3-dimensional moving form to that inspiration. My 4-year old son inspired me to create “Panchatantra-Animal Fables of India”, which became very popular both in India and the US. For 18 years it was active in my repertoire. Intellectual: This is the research part. Then comes creating a storyline like a screen-play. Every step must be documented – especially when you are working on your own and have no one to discuss ideas with. Writing is like having a discussion with your creative self. In this process you also might have visions of scene, sets, costumes. Physical: Developing the physical elements of the dance includes deciding what style will be employed, is it solo or group, use or non-use of lyrics, music composition etc and of course budgeting. You also think about who your audience is and what the venue would be. For eg, if you create a highly tech-based piece, then the theatres that will present you might be limited. Emotional: This involves fine-tuning the aesthetic part of presentation - costuming, lighting, and all those embellishment elements. It is crucial to focus on the rasa that you wish to invoke. This brings something to mind. Traditionally there was a practice of every character making their entry with a jathi. So, when the character of an ascetic entered, they too would automatically follow the same entry format. Even when I was young I used to find it comical to see a character in beard, dancing adavus! The rasa of the character or theme should not be disturbed. The production should emotionally touch the audience, not through melodrama, but by drawing people into the story. Intellectualizing a dance, although appropriate during concept forming stage, cannot be carried to the stage. An uncle of mine who was a renowned chef, used to say that an appetizing meal must contain all 6 tastes. A successful choreographic work is also like that. It must be balanced in its bhavas. Adding humor is a very important part of that recipe. And also the use of silent spaces! In print design they call it “white space”. We need “white spaces” in dance and its accompanying music also for the eyes and mind to rest. Finally the editing! Knowing what to keep and what to let go. Therein lies the success. That led me to my next question - whether she believes that crisp features are a better way of connecting to the audience as opposed to a traditional repertoire. Both can be enjoyable. Some Margam pieces are constructed with such perfection and performed with such mastery – like my guru Kamala’s Dasavataram varnam or Raja & Radha Reddy’s “Adenamma” - that you never get tired of watching them. They are eternally fresh. Personally though, I do question the way vipralamba sringara varnams (love in separation) are performed. In the midst of all the sad pining-for-love, suddenly the dancer starts prancing about with a smiley face into long jathis. Where is the “rasa” here? Only “virasa”! It will be nice if choreographers think about this a little. Even in a thematic presentation, many dancers seem to veer towards that Margam format of invocation, Varnam, Padam and Thillana because the structure of a Margam is intelligent. But I would like to encourage dancers to step out of this safety net, and approach their theme as if it were a continuous drama. Ramaa Bharadvaj is an avid follower of Chinmaya Mission, and heads the Dance Department at Chinmaya Naada Bindu, Kolwan, Pune. "Dance Intensives" are a major facet of CNB which have long intrigued me. I wondered - What would the agenda in each Dance Intensive be? What could a student expect from these workshops? My family has been with the Chinmaya Mission for over 35 years. Chinmaya Naada Bindu was conceived as a residential Gurukul by Swami Tejomayananda. Being part of an Ashram, it provides a spiritually charged environment in which to experience art. The Intensives are designed like a dance lab with interactions based on discussions, creativity and engaging the imagination. Our students come from all over the world. It is not just about learning a dance, but understanding the “how and why” of creating a dance. We have 7-day intensives twice a year. Our highly successful 21-day intensive happens in July during the monsoon. I bring in scholars and guest teachers for music, Sanskrit and dance enrichment sessions. Our workday begins at 7am with meditative movement or strength training followed by almost 3 hours of class, and then again another 4 hours of evening class/discussions/theory. There are also spiritual discourses and performance evenings. We have 2 private temples on campus and temple prayers are a part of the daily activities. Another opinion I repeatedly ask Artistes for is their take on the role of organizations in promoting art and culture. Ramaa Bharadvaj herself is an organizer of a major arts festival at CNB, showcasing some of the top names in the Music and Dance fraternity. Her thoughts on how a festival should be organized and the challenges that organizers face. In the globally interactive society connected by the web, there is a trend towards mimicking Western culture and it starts with mimicking their music and their dance. This is not natural thing at all. The classical arts of our country represent our culture consummately. Arts Festivals such as ours are a way to re-introduce these to our people. 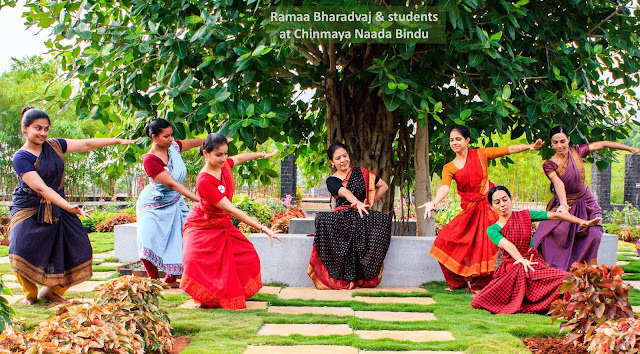 Now in its 5th year, the Naada Bindu Festival (NBF) is designed as a 3-day performing arts retreat. It is like a refreshing weekend-vacation - natural surrounding, fresh air and expansive areas surrounded by hills. Guests stay in this serenity of our ashram and enjoy performances and lecture demonstrations by superstars in the field of classical arts. We call it an Arts-as-a-Lifestyle experience. Spiritual satsang with Swami Tejomayananda is also part of this holistic experience. Our challenge? Raising funds. It somehow all comes together with the work of our small staff and volunteers, and private donations, but mostly because of the blessings of Swami Tejomayananda. Just keep your creative juice flowing by exercising the “creative muscle” consistently. There seems to be this desperation to create an “original work”. But what the word original really means is, to return to the Origins. So, creativity is not about innovating new things (for after all there is nothing new under the sun) but linking thoughts, things and experiences and harmonizing them into an avatar of your own. The Arts are about re-imagining the inherited traditions from which we draw our inspiration and techniques. Young dancers can work with mentors and a dramaturge. You know, when sage Bharata created the first drama he actually had a dramaturge – Brahma! It was Brahma who advised him to add dance to his production. When you are immersed in your own work you tend to get enmeshed in it. So, a knowledgeable external eye is useful. 1) Be neutral to both praise and criticism. Otherwise it will be a roller coaster ride of elation and depression. 2) Do not let your work define who you are. Instead, you define your work. When you grow and change, your work will also grow with you. 3) Listen to your heart. What is important is what inspires YOU. Many trendsetters have all been waved aside in the beginning by the public and the critics. Never ignore that “aha” moment, that will visit you when you are creatively engaged. 4) Feel free to make mistakes. Artists must cultivate the spirit of Artivism at heart (activist + artist). We cannot survive in our own cucoon. We must first look at the arts community as a whole to find our role in it. Here I will share a personal experience that illustrates what one artist can initiate. In 2003, the California Arts Council, a governmental arts support agency, was laid on the butcher block by the politicians. When I got the news, I called Lewis Segal, the dance critic of Los Angeles Times and asked him for a story to raise awareness. He shot back with "You artists whine all the time. Why don't you DO something first, and then I will write about it?" He was right. So I approached influential advocacy groups to ask for ideas. But they sort of laughed in my face. There was only 2 weeks before the matter went to the state legislature. Then I decided to mobilize the power of the people at the grassroots level. In just 10 days I created the Arts-Alive Rally in Santa Monica. It brought together hundreds of dancers, musicians, theater people, painters, arts educators, administrators, and of course the media. I hand-designed a logo, which became the State symbol for supporting the Arts. I drafted petition letters for artists to sign and we bombarded the Capitol with them. I had no resources and no experience in anything like this. But I became the spokesperson for the entire arts community in California. I gathered statistical data about the impact of arts, went on interviews on the National Public Radio and television to speak about the role of arts as a life saving resource. Our voices reached the Capitol and the Arts Council was saved. Later, I received the Director’s Award from the California Arts Council for outstanding contributions to the Arts in California. We all have the inner capacity to be spokespeople for causes that are larger than our puny personal agendas. We must develop a mindset for it. It is not enough to present our art-form, we must also constantly represent it through writing, speaking, teaching and involvement. On that extremely inspiring note, the Kala Samvada with Ramaa Bharadvaj paused. I say "paused" because her infectious persona and motivating presence give me some beautiful perspectives, and I hope to interact with her very soon.